Press Releases | KIN-TEK | KIN-TEK Analytical, Inc.
Ms. Danet Vrazel, Vice President/General Manager of KIN-TEK Analytical, Inc., and Mr. Kevin Price, Instrument Assembly Technician, attended a presentation at La Marque Independent School District on Thursday, December 6, 2018. KIN-TEK Analytical, Inc. is proud to support the local ISD by making a donation of a portable eye wash station. It is my pleasure to announce that Ms. Danet M. Vrazel is promoted to the position of Vice President, General Manager. 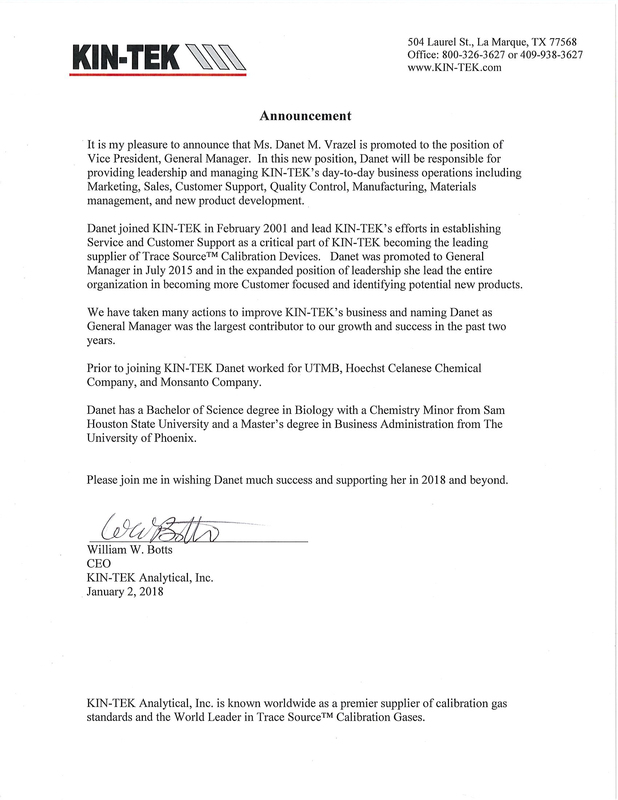 In this new position, Danet will be responsible for providing leadership and managing KIN-TEK's day-to-day business operations including Marketing, Sales Customer Support, Quality Control, Manufacturing, Materials management, and new product development. Danet joined KIN-TEK in February 2001 and led KIN-TEK's efforts in establishing Service and Customer Support as a critical part of KIN-TEK becoming the leading supplier of Trace Source™ Calibration Devices. Danet was promoted to General Manager in July 2015 and in the expanded position of leadership she lead the entire organization in becoming more Customer focused and identifying potential new products. We have taken many actions to improve KIN-TEK's business and naming Danet as General manager was the largest contributor to our growth and success in the past two years. Prior to joining KIN-TEK Danet worked for UTMB, Hoechst Celanese Chemical Company, and Monsanto Company. Danet has a Bachelor of Science degree in Biology with a Chemistry Minor from Sam Houston State University and a Master's degree in Business Administration from The University of Phoenix. Please join me in wishing Danet much success and supporting her in 2018 and beyond. James (Jim) J. McKinley, founder of KIN-TEK Laboratories, Inc and later President of KIN-TEK Analytical, Inc., has retired from KIN-TEK on July 31, 2017. Jim started the Company in 1970 with the idea of developing and expanding permeation technology as a means of calibrating analytical instruments and generating test gas mixtures. Through his wide-ranging work Jim became widely known as an industry expert for solving difficult calibration problems. Jim fostered, guided, and managed KIN-TEK as it grew to become a world leader in applying permeation technology to a wide range of calibration applications in research laboratories, environmental health and safety, petrochemical operations, quality control, and many others. Today KIN-TEK products are sold in all industrialized countries and its customers include many fortune 500 companies, universities, and government organizations. Jim received his bachelor and master's degrees in physics and mathematics at the University of Houston. Jim has been active in ISA and became an ISA Fellow in 2008. Jim has authored scientific articles, presented technical papers, and consulted on standards development projects including with the National Institute of Standards and Technology (NIST). The entire KIN-TEK team thank Jim for creating and growing the company and wish him the very best. Upon Jim's departure, the business processes of KIN-TEK will not change and will continue to be managed by Ms. Danet Vrazel, General Manager. KIN-TEK Laboratories, La Marque, Texas, is proud to announce the release of a new FlexStream module - the FlexGF gas-fed oven permeation module. This module enables the FlexStream instrument to create gas standards from high vapor pressure gases such as NO, CO, O2 and others not available in liquid filled tubes. When used in conjunction with a certified Trace Source™ Series 57 gas permeation tube (source), the FlexGF allows control of component gas pressure and purge rates while the source is maintained at constant oven temperature. Oven temperature and pressure are easily adjusted via the FlexStream front panel color touchscreen or by an external computer with Modbus communications. This instrument was show-cased at PITTCON in Atlanta, Georgia March 11-15, 2011. KIN-TEK Laboratories, La Marque, Texas is proud to announce the release of a new FlexStream module - the FlexPM oven permeation module. The FlexPM is an independently controlled permeation tube oven designed to work in parallel with the FlexStream Base Module. The FlexPM allows concurrent operation of an additional set of permeation tubes that may operate at a different temperature from tubes in the Base. The FlexPM can use KIN-TEK Trace Source™ disposable or refillable permeation tubes. Oven temperature is easily adjusted via the FlexStream front panel color touchscreen or by an external computer with Modbus communications. Primary dilution flow rate is provided by the upstream FlexBase module. Secondary diluiton to achieve very low concentrations can be optionally provided by a downstream FlexSD module. The FlexPM is one of several auxiliary modules designed to work with the Base Module. Up to 5 additional modules can be used with a single Base Module to form a complete gas standards generating system. This instrument was show-cased at PITTCON in Orlando, Florida February 28-March 5, 2010. KIN-TEK Laboratories, La Marque, Texas is proud to announce the release of a new FlexStream module - the FlexSD secondary dilution module. The FlexSD Module is used in series with the FlexStream Base Module and any additional permeation modules to extend the range of concentrations attained from permeation tubes. Using the full flow range of the standard Base and FlexSD modules allows a concentration range of 10,000:1 from a single permeation tube. For applications requiring fixed flow of the output mixture, the FlexSD can provide adjustable concentration over a 200:1 range. Gases & Instrumentation is pleased to announce that James J. McKinley, President of Kin-Tek Laboratories Inc, La Marque, Texas, is the Gases & Instrumentation 2008 Gases Technologist of the year. James (Jim) J. McKinley of KIN-TEK Laboratories has been named a 2008 Fellow Member by the ISA in recognition of his contributions to calibrating and validating analytical instruments using permeation devices. If you are interested in distributing, representing, or reselling KIN-TEK products please click here.